After the restoration of King Charles II in 1660, title to Nottingham Castle passed to the Duke of Newcastle whose ambition was to erect a new and modern building. Although over 70 years-of-age he began the project with enthusiasm. Every remaining stone of the old Castle was removed and several feet of rock itself cut away as a platform for the new house. The Duke only lived long enough to see the start of his mansion though his son carried it on to completion in 1679. Built in the form of an elongated oblong, the mansion had two wings running westwards. The principal rooms on the first floor were the State Rooms for royalty, a hall, drawing room, library, dining room and gallery and so the regal splendour of the old Castle returned for a time, providing residence for Queen Anne and successive Dukes of Newcastle, one of whom became Prime Minister twice. 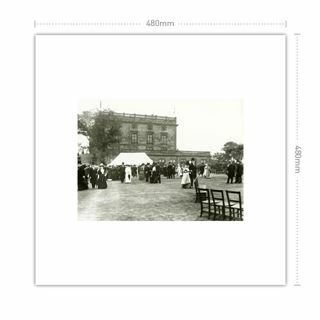 With the industrialisation of the town the mansion's attraction gradually diminished and by 1750 the Duke's visits had come to an end. Converting the building into apartments, the Duke rented them off to wealthy tenants. 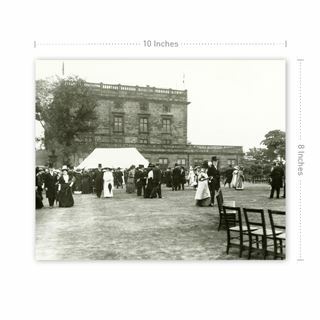 Later used as a boarding school, the mansion slowly declined and the gardens were let off as allotments. The last residents quit the building in 1829 and it remained unoccupied. By this time great changes had come to Nottingham as part of the Industrial Revolution: the town's burgesses would not allow their fields to be built on so the surrounding green belt effectively enclosed the city. In-filling with cramped, insanitary working-class hovels was the only way of accommodating the swarming inhabitants. Conditions worsened with lowering wages and unemployment particularly for growing numbers of Framework knitters. Thousands of men and women trudged the streets with banners inscribed: 'Pity Our Children' and 'We Ask for Bread'. The town was described as 'the worst slum in the Empire apart from Bombay.' Workers' frustration at a system that denied them any say in local or national affairs produced regular explosions. There was a cheese riot, a meat riot and a bread riot, and the government's usual answer was to reinforce the local garrison. Of the 30,000 people living in Nottingham in 1830, half were on poor relief and out of 1,100 cases of cholera, 290 were fatal. Agitation for parliamentary reform gripped in England in the early months of 1831 and at the May election, Nottingham returned two reform candidates. The Duke of Newcastle, whose derelict Castle loomed over the town, opposed reform and presented a petition to the House of Lords. Cold and pompous, the Duke inherited his Dukedom when ten years-of-age and had little conception of what it meant to be anything else. A big man with a loud voice, he loved making passionate gesticulations in a grand manner. Even the Duke of Wellington, not exactly a progressive, declared: 'There never was such a fool.' During the Luddite troubles the Duke of Newcastle had tried to persuade the Home Secretary that they were instigated by Napoleon agents. The Duke once admitted: 'I have only to show my face to cause a riot. The Reform Bill was thrown out in th early morning of Saturday 8 October but the stunning news only reached a handfull of people in Nottingham - everyone was at the Goose Fair. When the London mail coach brought the news next morning, wilder elements attacked the premises of known anti-reformers. The Mayor read the Riot Act and by evening the Hussars had been called out. On the Monday 20,000 people thronged to a meeting in the Market Place where resolutions were passed in support of reform. Though the meeting broke up peacably, shortly after, windows were smashed. 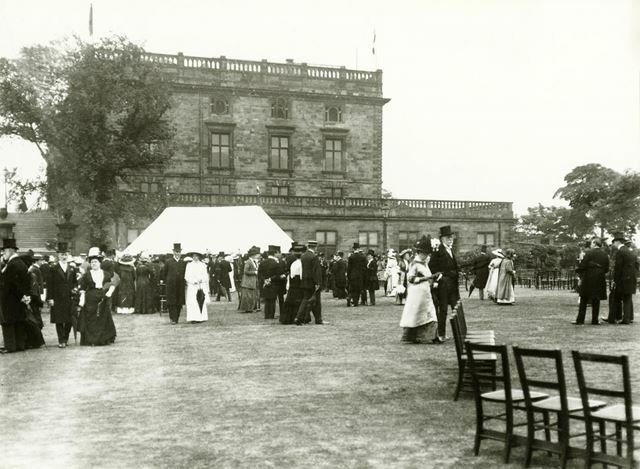 Some of the Hussars had been drawn away by disturbances at Derby and those left behind were unable to cope with those rioters who marched on Colwick Hall, home of John Musters, well-known opponent of reform. John Musters was away but his wife, Mary Chaworth, Lord Byron's boyhood love, cowered in the bushes with her maid while the rioters broke up railings for weapons and unsuccessfully tried to fire the building. The mob headed back to Nottingham extinguishing street lamps as they went. Incredibly the Castle was undefended. After breaking in the doors and windows they smashed an equestrian statue of the founder, piled up furniture and set fire to it. Tapestry was sold at 3s a yard to bystanders. The flames spread throughout, burned all night and by morning was a smoking shell. The law held that ratepayers as a whole were responsible for keeping law and order in their area, but ironically, compensation could not be extracted from the ratepayers of Nottingham because Henry VI's charter had deemed the Castle to be outside the town's boundaries. The Hundred of Broxtowe had to pay. The Duke of Newcastle was awarded £21,000 damages and he promptly announced it was insufficient and refused to take any more interest in the site. For nearly fifty years the blackened and gutted shell was to look down over Nottingham. In 1859 there appeared to be a possibility of war with France and throughout the country patriotic bands of men formed themselves into local Volunteer Rifle Corps. 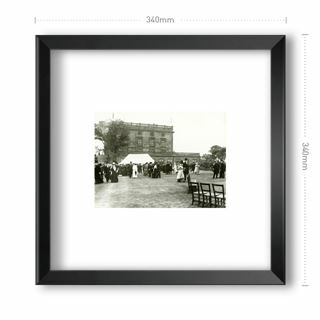 The Duke of Newcastle declared an interest, gave his permission for the Castle grounds to be used as a parade ground with the outbuildings converted into an HQ and orderly room. The Corps would be named The 'Robin Hoods'. The Town Council resolved that the Castle and its grounds would be an ideal site for a Museum of Fine Art and the Duke of Newcastle granted a lease of the Castle and its grounds for a term of 500 years. The Right Honourable W.E. Gladstone, as one of the Trustees of the Duke of Newcastle, gave his personal attention to the whole scheme. 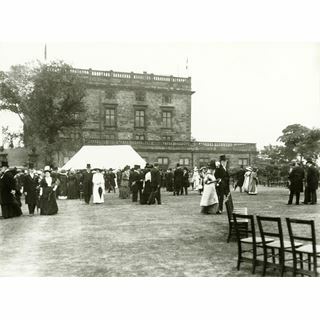 On 3 July 1878 the Prince and Princess of Wales opened the first provincial Museum of Fine Art at Nottingham Castle. The photograph seen here was taken after the castle was restored as a Museum and Art Gallery.